Remember the econ class we took in college ?. In microeconomics, supply and demand is an economic model of price determination in a market. 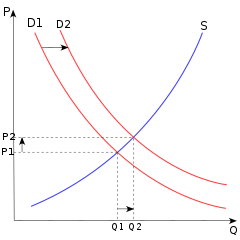 It postulates that in a competitive market, the unit price for a particular good, or other traded item such as labor or liquid financial assets, will vary until it settles at a point where the quantity demanded (at the current price) will equal the quantity supplied (at the current price), resulting in an economic equilibrium for price and quantity transacted. In the free market, we always correct ourselves. If the demand is low we reduce the supply if the demand is high we increase the supply. But market correction takes time. We always have a situation where we either have more supply or more demand. Many factors determine the demand and the supply. For oil and gas factors such as war or political change will impact the demand and the supply. Increasing of construction and development projects, cheaper alternative energy and expectation of the future price will impact the demand. The above curve is showing demand curve shift. The demand curve always slopes down. The lower the price the more consumer demand. The lower the oil and gas price the more consumer use oil and gas. The supply curve in the other hand always slopes up. The higher the oil price the more supplier produces oil. So what’s going on with the current oil and gas price ?. When the oil and gas price were high we produced a way more oil and gas than we need (i.e., much more supply than demand). So logically, we would correct ourselves right ?. The producer would cut down the supply. But not every supplier want to do it. Suppliers like US where operating cost is high would have no choice. Other suppliers with much less operating cost and have high dependent on oil and gas production may resist to cut down. For countries highly dependent on oil and gas it will be a big problem. These countries may not be able to operate at a low price and may not be able to survive. We certainly do not want to see these countries go bankrupt. What we really want to see is where the price is just about right, no war, no political instability, and no countries go bankrupt. Figure out the right amount to produce for each supplier (i.e., we can’t just cut production across the board). Some suppliers should not cut at all. Some must cut a lot or even stop production. Do the right things: stop the war, stabilize countries, increase construction and development projects, do not depend just on oil and gas. These will shift the demand curve to the right hence will set to a better price. Supplier / producing country needs to figure out how much oil and gas they have and have clear road-map or have exit strategy.